Essentials of Economics is built around narratives and stories, many of them pulled from real life. In every chapter real-world examples are used to teach core concepts and motivate student learning. 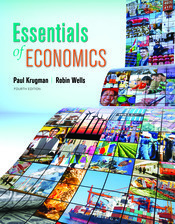 Essentials of Economics is unrivaled in its worldwide perspective, which is deeply integrated into the narrative, and featured in many of the applications, cases, and stories, as well as in the data-based Global Comparison boxed features.